When our son, Peter, was in graduate school, he stayed in a run-down house with a number of Colombiano students. The house was on Hillmont Street, so they named the house “Casa Hillmont”. During his time at Casa Hillmont, Peter’s Spanish skills improved markedly, but he also learned to cook Colombian comfort food. One favorite was and is tostones. 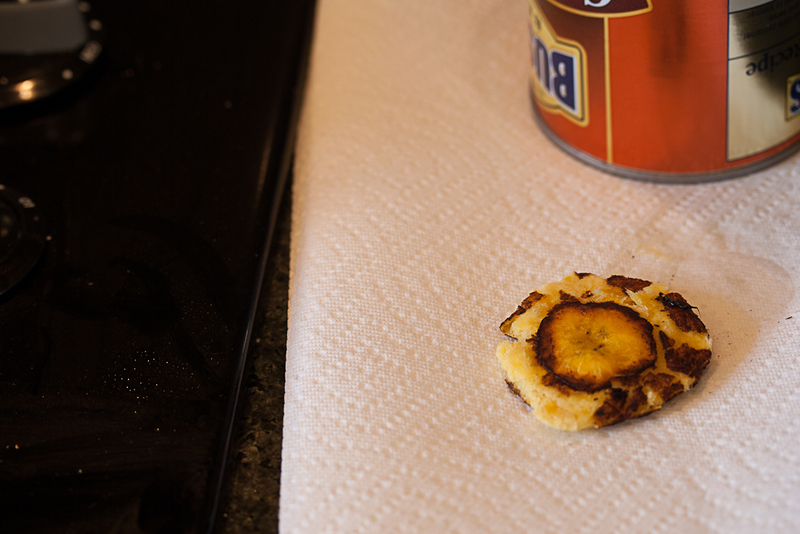 Tostones are the one way I know of to use plantain. 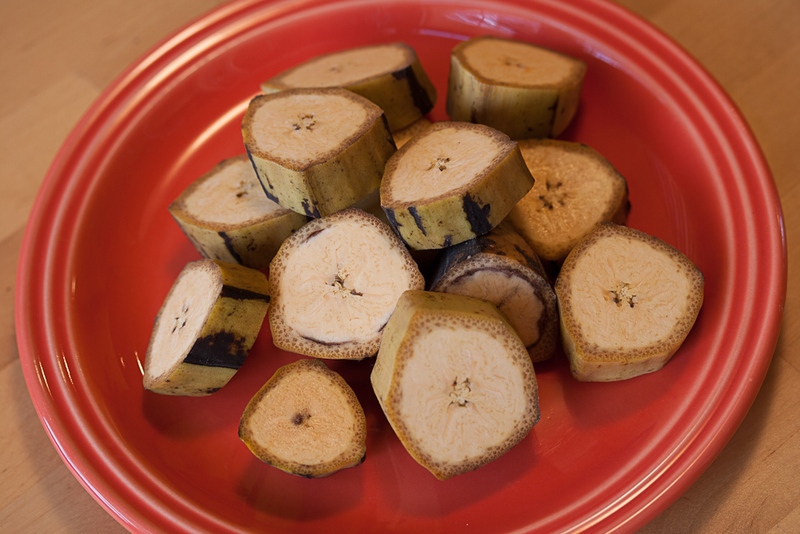 This banana relative usually sits neglected in the produce section of the grocery store. 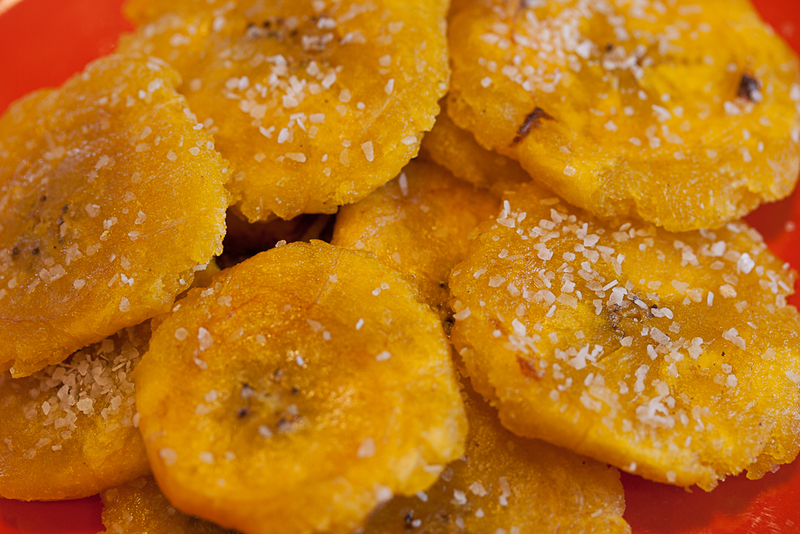 Neglect those plantains no longer because tostones are easy to make, delicious as a snack, and a great substitute for corn chips with guacamole. 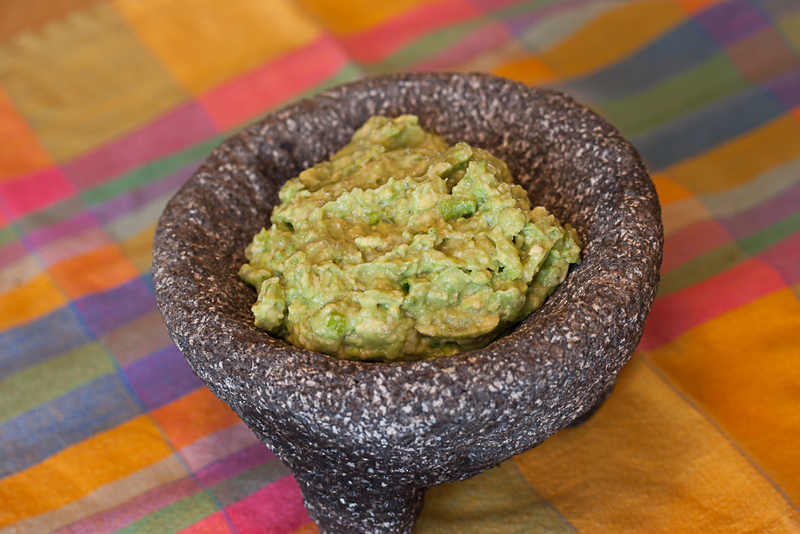 Guacamole is a Central American dish which has been imported to the American Southwest and eventually to the whole world. Probably that’s because it is easy to make The mellow flavor of the obligate avocado balanced against citrus and chile accents is hard to resist, especially with a corn chip and cold margarita in hand. According to Diane Kennedy, the legendary Mexican cookbook writer, the word comes from two Nahuatl (Aztec) words, ahuacatl (avocado) and molli (mixture). Other authorities say that the word ahuacatl actually means “testicle” referring to the shape of the fruit and its tendency to grow in pairs. More than that, the Mesoamericans reportedly believed that eating the fruit contributed to sexual prowess. Those interesting facts aside, it is easy to eat a bowl of fresh guacamole by oneself. There are probably as many recipes for guacamole as there are cooks who make it. Most traditional recipes include chopped tomato. For me, the version which tends to be favored in Santa Fe is the best. 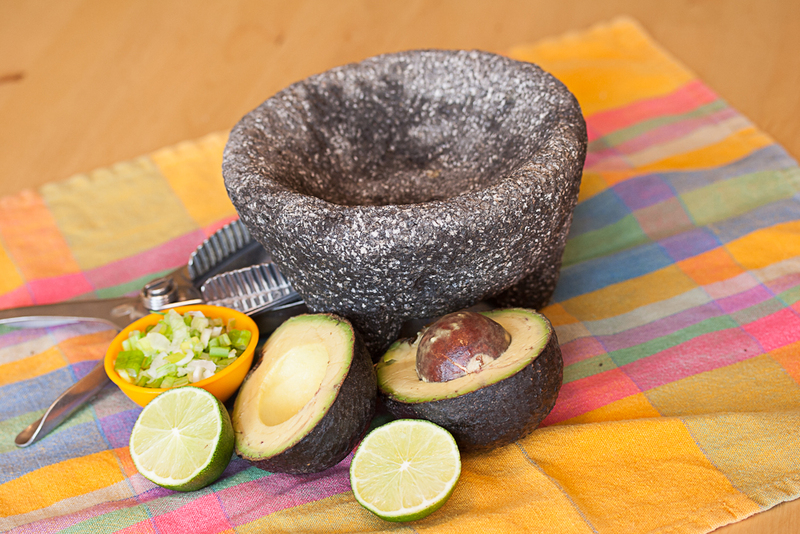 It uses coarsely mashed avocado, lime juice, a little chopped onion, salt, and pepper. Garlic and cilantro are acceptable additions, and chile depends upon your tolerance for heat. I do balk at one addition that you sometimes see – mayonnaise. The Aztecs never used mayonnaise! Honestly, I prefer guacamole with a kick, but because my wife has zero tolerance for chile, I make it without any zest and then sneak a little chile into my portion. The recipes to follow should be enough for two people. For larger groups, just increase proportions accordingly. Add the lime juice and combine with the mashed avocado. The day after our farmers market feast, Sarah went off to the restaurant where she was working. Evan slept in after his last night cooking at the restaurant where he worked. Around noon, he volunteered to make lunch and headed out to the kitchen. There were lots of leftovers from the night before, but when he had finished you would not have recognized at all that they were leftovers. 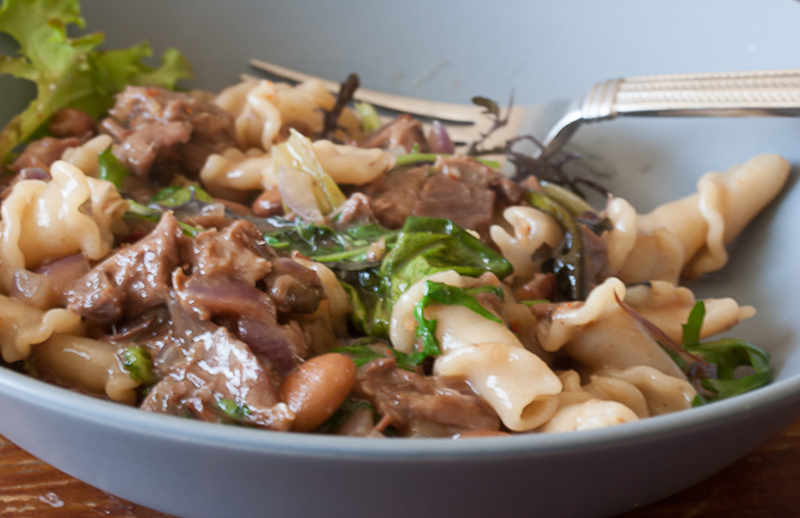 He whipped up a fragrant pasta dish which included the leftover lamb shanks, a reduction of the cooking liquid, freshly cooked pasta, mushrooms, and some wilted baby salad greens. The pasta he chose was campanelle which with its bell shape and fluting was a perfect choice to hold the sauce. This unusual pasta shape was listed in a catalog of Sicilian pastas at the end of the nineteenth century. You can read more about it in an interesting book, Encyclopedia of Pasta, written by Oretta Zanini de Vita and translated by Maureen B. Fant (University of California Press, Berkeley, 2009), which describes the history and making of Italian pasta. Bring the braising liquid to a boil and add the campanelle. Boil until the pasta is al dente. Add the lamb and warm over low heat until heated through. While the pasta is boiling, heat the olive oil in a small sauté pan over medium heat. Add the mushrooms and sauté for 3 minutes. Stir the mushrooms into the lamb and pasta. Add the salad greens, toss lightly, correct the seasoning and serve immediately. Just two more dishes to finish the description of the celebratory meal we had from foods we collected at the Ferry Building Farmers Market. Both are easy to make but surprisingly unique. The first was a refreshing salad made with amazingly crunchy and green baby cucumbers and fresh salad greens accented with bits of nori and toasted white sesame seeds. 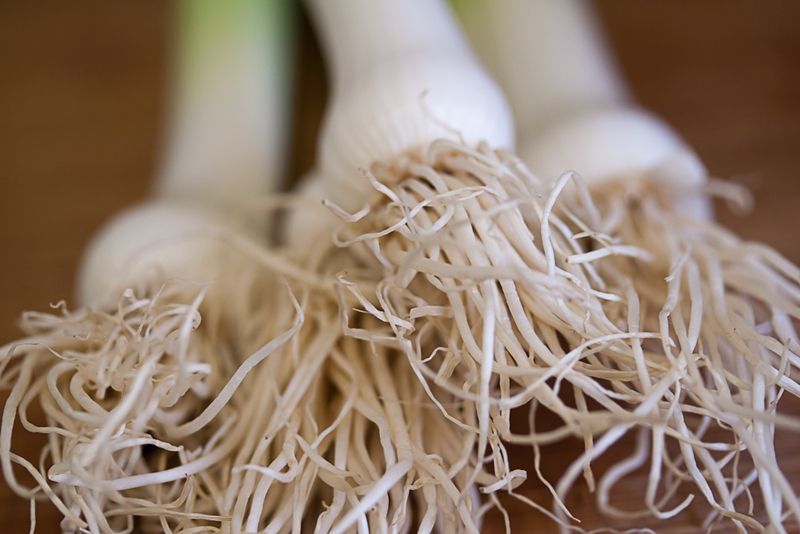 The second was a delicate sauté of royal trumpet mushrooms with scallions. As a bonus not from the farmers market we had a fresh loaf of home-baked Tartine basic country bread made from the recipe in Chad Robertson’s elegant and detailed cookbook, Tartine Bread, Chronicle Books, Ltd, San Francisco, 2010, pages 41-79. (Yes, that’s a long recipe. I plan to post an abbreviated version soon. 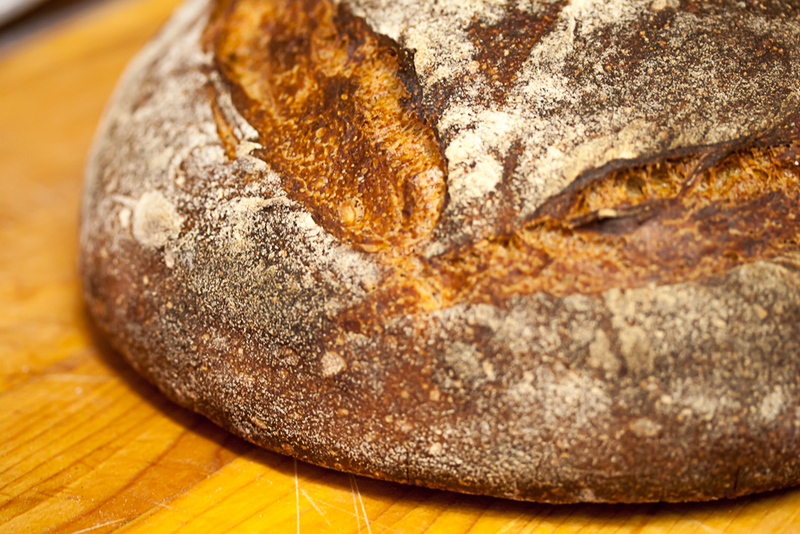 That should enable you to reproduce the absolutely best home-made bread I have ever tasted). 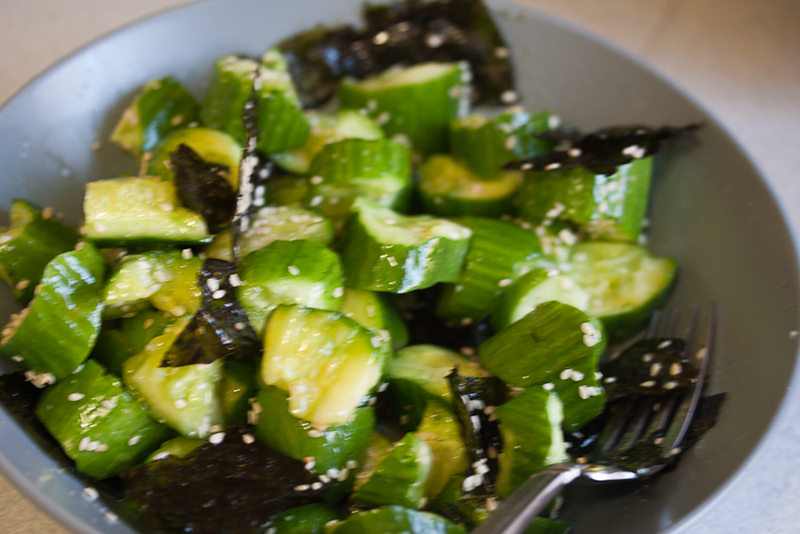 Combine the cucumbers, greens, and nori in a serving bowl. Dress lightly with your favorite vinaigrette. If you like, add the optional sesame oil. Toss. 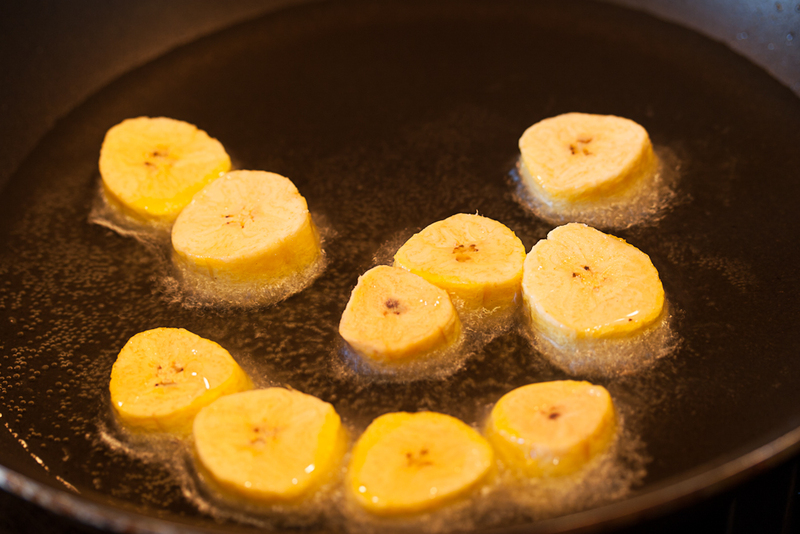 Heat the butter and olive oil in a medium sauté pan over medium-high heat. 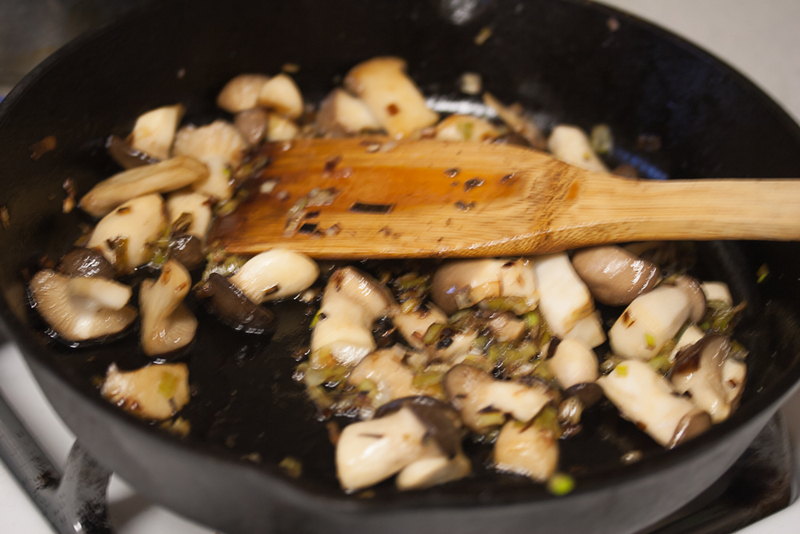 Add the mushrooms and scallions and sauté until cooked through. Correct seasonings with salt and pepper. We set the table with the bouquet of multi-colored sweet peas bought from the flower stall, plated up the feast, and enjoyed it while Evan finished his last day at the restaurant. San Francisco’s Ferry Building Farmers Market is much more than the outdoor stalls which attract crowds a couple of days each week. There are all sorts of shops inside the building selling everything from kitchen gear to local caviar. 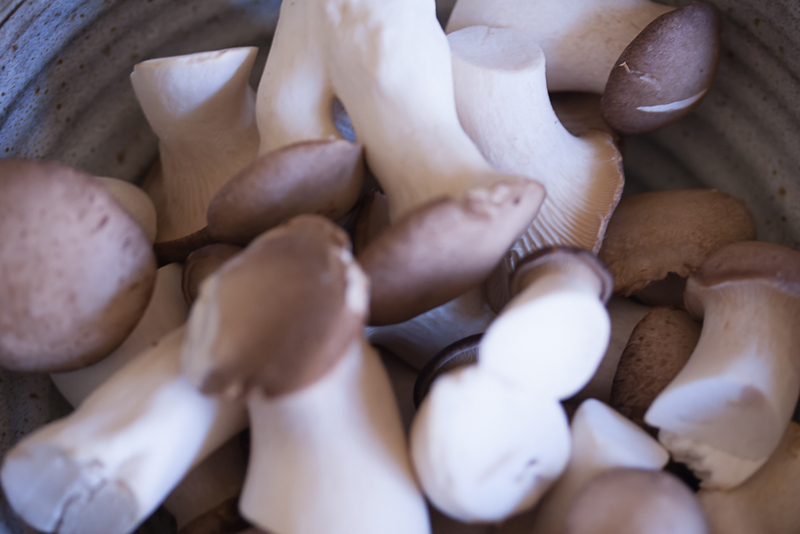 The cheese shops are outstanding, the bakeries are great, and the mushroom place has a huge choice of the freshest specimens. For the carnivores, there are several great shops, but a favorite of both Sarah and me is Prather Ranch. We bought four succulent lamb shanks already done up in plastic, but clearly very fresh. These would be the centerpiece of our farmers market meal. After getting the lamb shanks home, Sarah browned them in a huge Magnalite casserole along with a couple of cloves of smashed garlic and some aromatic vegetables: carrots and onions. Chefs seem divided over the use of celery in the classic mirepoix combination of onions, celery, and carrots. Some refuse to use celery as they think it is too bitter. 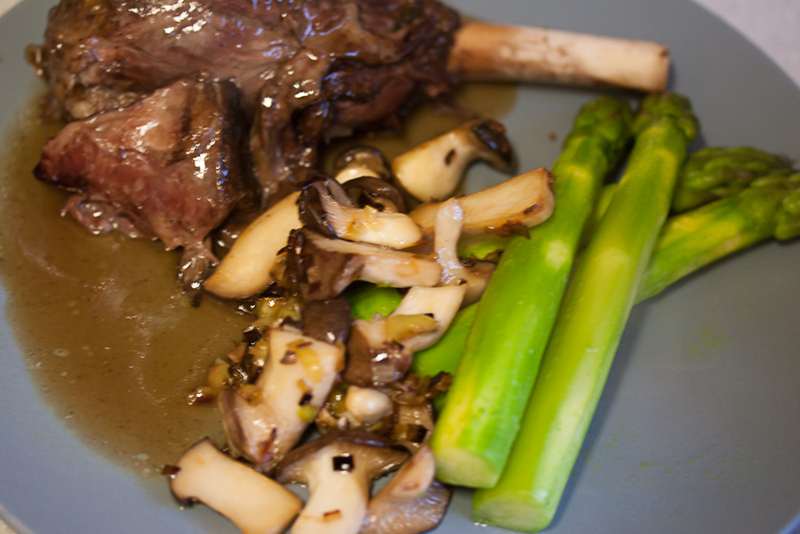 Whatever your own personal bias might be, be sure to brown the lamb shanks in some oil and your choice of vegetables. Add some stock or water and a good slug of red wine. Season with salt and pepper. Toss in a generous handful of fresh thyme and Mediterranean (not Mexican) oregano. Bring to a boil, and then cover and reduce the heat to the lowest simmer. 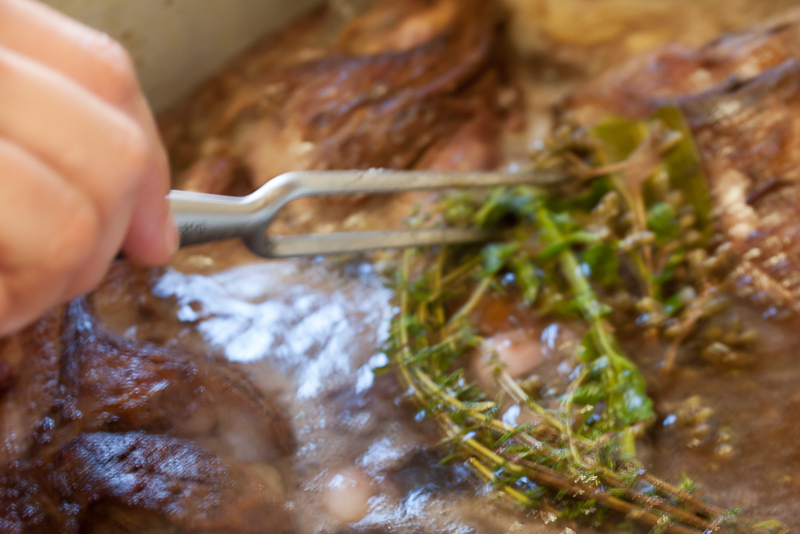 Some purists insist on using rosemary and garlic as the classic seasoning for lamb. You can do that instead if you prefer, but I can guarantee that thyme and oregano work beautifully. Sarah finished her dish over low heat on the stove top, turning and basting frequently as well as skimming off excess fat. 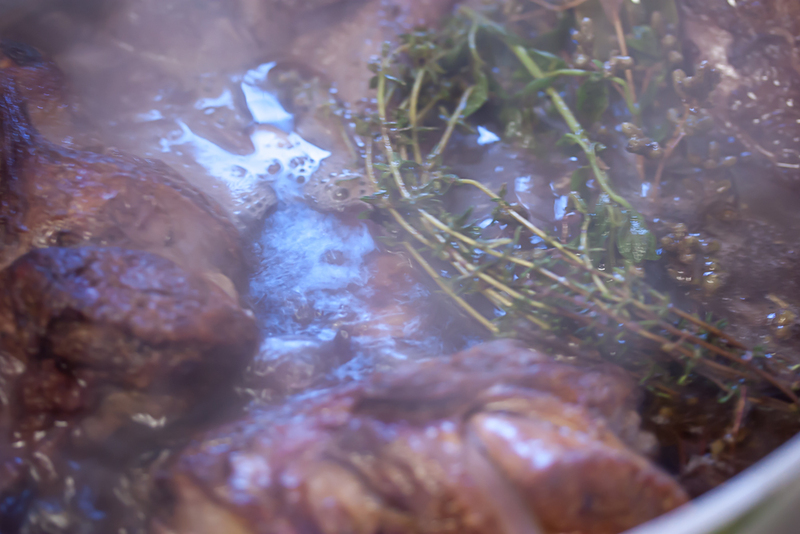 If you prefer, you can braise the lamb shanks, covered, in the oven at low heat – no more than 250°F. Be sure to check the pot frequently and skim the rendered fat. Plan to braise the shanks for at least 2 to 3 hours or until the meat is well done, tender, and falling off the bone. 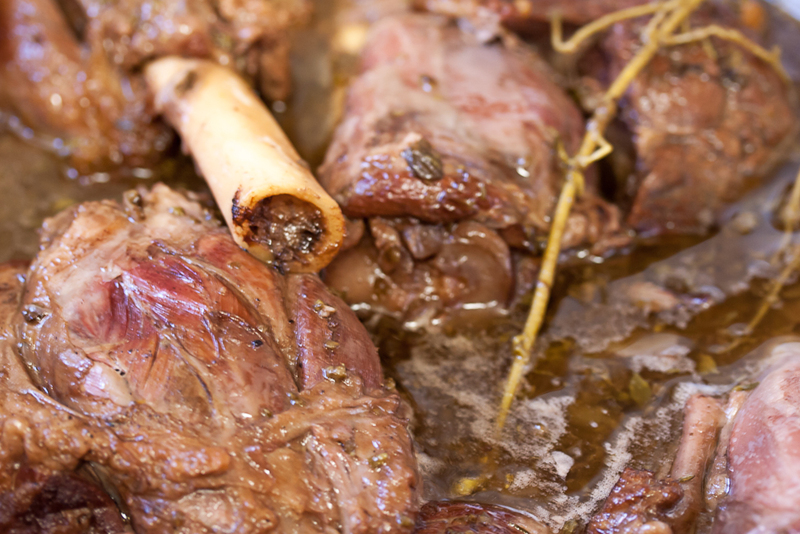 When they are done to your liking, remove the lamb shanks to a platter and serve them immediately while still warm. 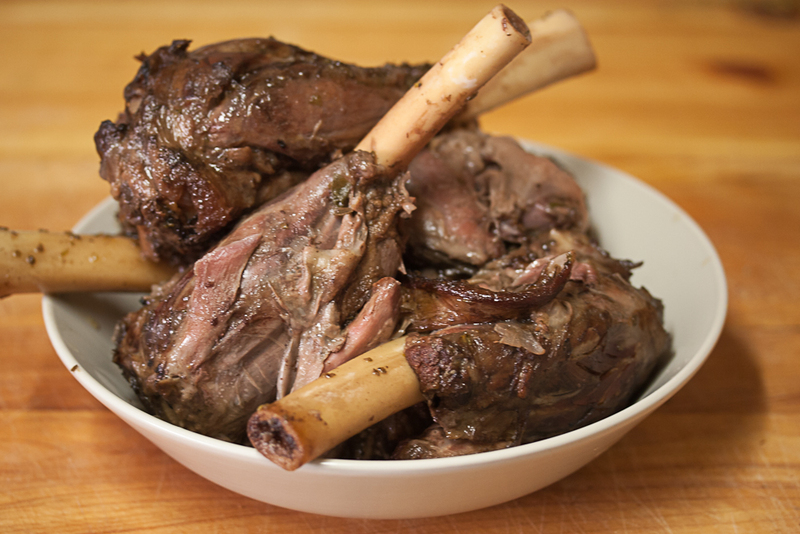 Lamb shanks vary greatly in size, but in most cases you should allow one for each diner. With only three of us and four lamb shanks we wound up with leftovers. I want to thank Baking with Sibella http://bakingwithsibella.wordpress.com for nominating me for the Liebster award. It is a special honor because Sibella has such a great blog filled not only with some of her beautiful baking efforts but also great photo images and examples of her varied artistic accomplishments. For certain you should check out her recipe for rhubarb and strawberry galette. If the images and recipe don’t make you salivate and pull out your baking gear, you are not a real food enthusiast! The Liebster award is reserved for blogs of fewer than 50 followers, so my numbers definitely qualify me, but with friends like Sibella perhaps I can beat that limit. Another part of our recent meal provided from our trip to the Ferry Building Farmers Market. Even though these days asparagus is available the year around, local, really fresh asparagus is still a harbinger to the spring in northern climes. It is then that it is at its best. 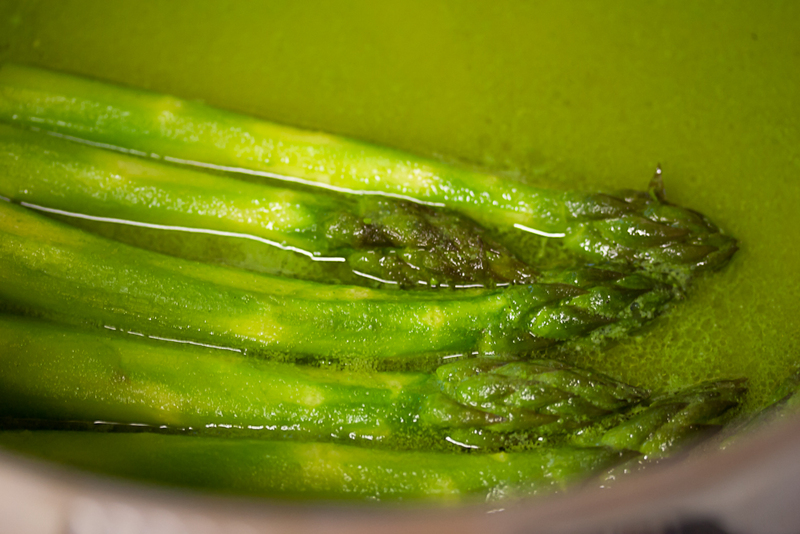 There are lots of great ways to cook asparagus – steamed, boiled, baked, and grilled. This method taught to me by Sarah produces the greenest, freshest-tasting asparagus I’ve ever had. We bought three bundles of the thickest stalks we could find in the asparagus stall at the market. When we were ready for dinner, Sarah cut the thick ends of the stalks where the tender flesh begins. You probably already do the same. 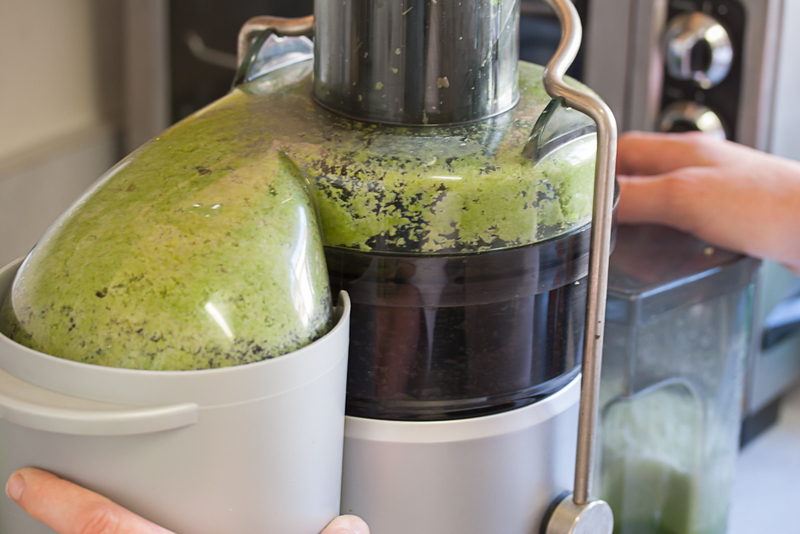 I usually throw away those woody ends, but Sarah dropped them into her electric juicer and got the greenest asparagus juice I’ve ever seen. Actually, I’d never seen asparagus juice before. 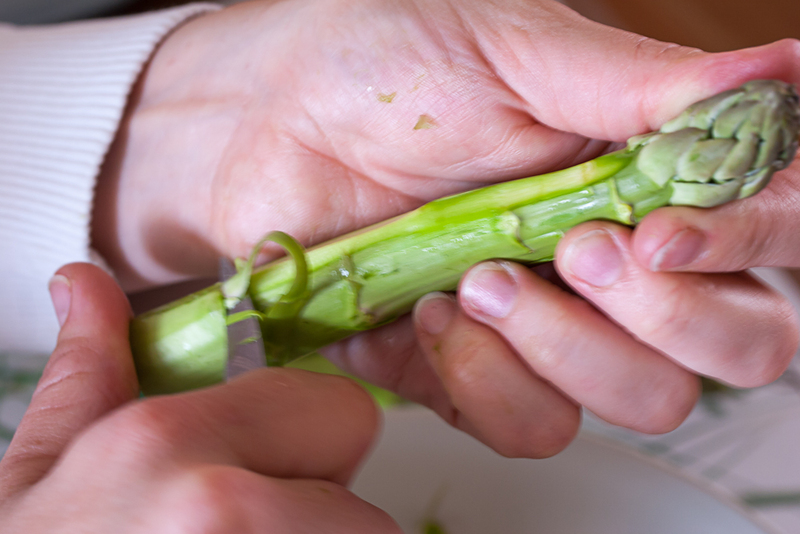 Next, using a very sharp paring knife, Sarah made the very thinnest peelings of the skins of the asparagus spears. Then she put the juice, seasoned with just a little salt and pepper, in a pan large enough to allow the spears to lie flat. 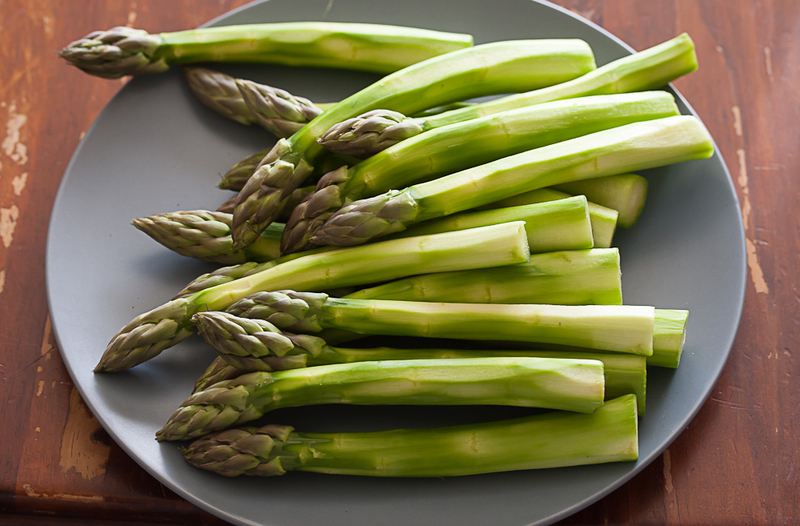 She brought the juice to a boil, dropped in the spears, and cooked them for just a few minutes until the asparagus was tender. The finished spears were a bright green color and fragrant. 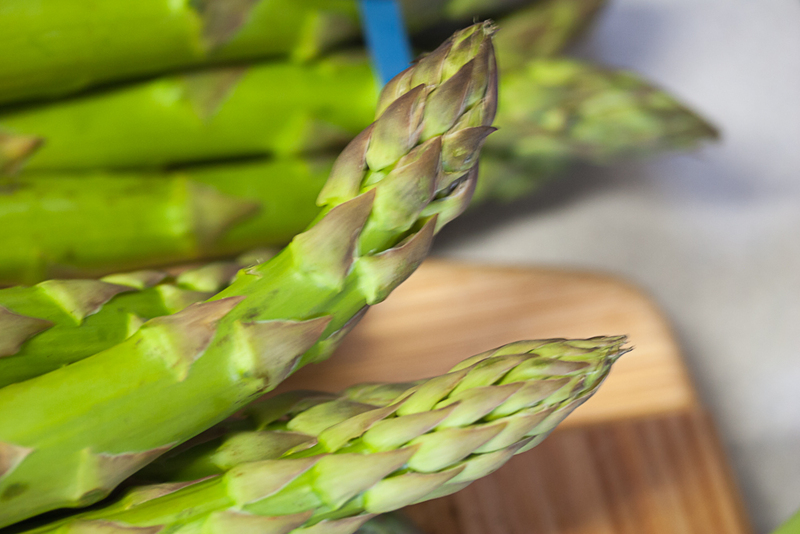 Sarah served the asparagus with just sections of lemon to squeeze over it, but you can use whatever is your favorite asparagus sauce – hollandaise, aioli, or home-made mayonnaise. Our trip to the Ferry Building Farmers Market coincided with the day that Sarah and Evan got the keys for their new restaurant space, so we were in a celebratory mood. Never mind that Evan had one last night at his current restaurant, Susan, Sarah, and I were going to have a party. 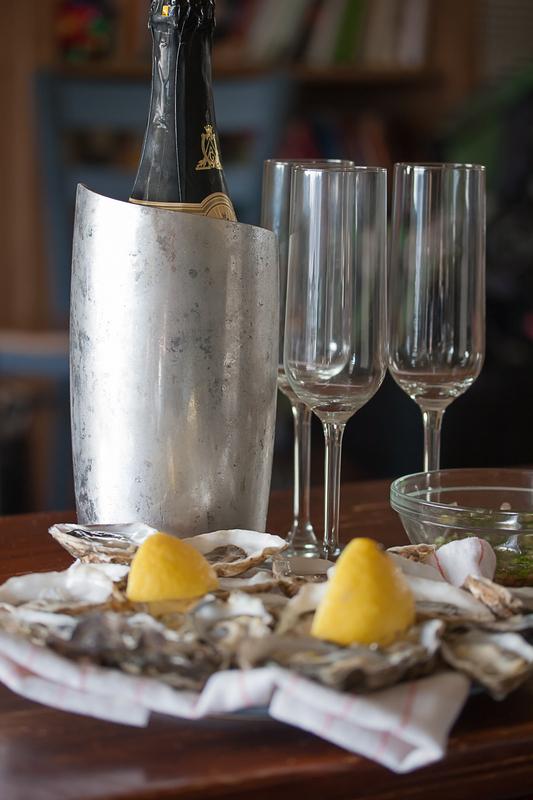 And what better way to begin the celebration than champagne and oysters on the half shell. Two dozen oysters sounded just about right for the three of us, and the oysters from Hog Island Oyster Company were fresh and just the right size. We brought home a mesh bag iced down for the short journey home. 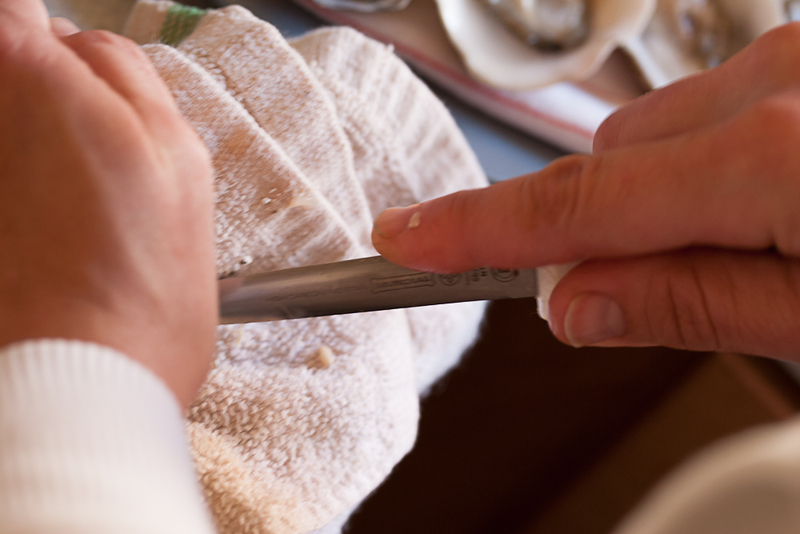 At dinner time, Sarah brought out her oyster knife and made short work of the shucking. Of course, she is a professional, so she knew what she was doing. She wrapped each shell in a kitchen towel and grabbed it firmly with one hand. Using an oyster knife, she slipped the point of the knife into the hinge of the shell, twisted the knife firmly, and popped open the innocent oyster. She cut the muscles holding the oyster in the shell, removed the top shell, and placed the fresh oyster on a bed of ice. If you have never opened an oyster on your own. There are a few important pointers. First, be sure to use a good-quality oyster knife. Regular knives can bend and break, and you can wind up plunging the blade into your hand. Serious injuries to blood vessels and tendons can result. Second, the towel is supposed to provide some protection so it should not be flimsy. If you are a little nervous, Kevlar gloves are available and provide more safety. 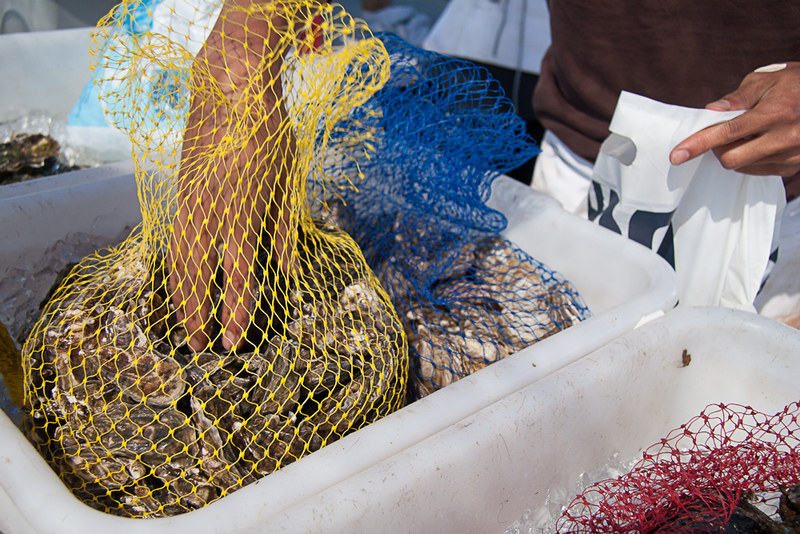 If you are still anxious, have your fish monger shuck the oysters before you bring them home. 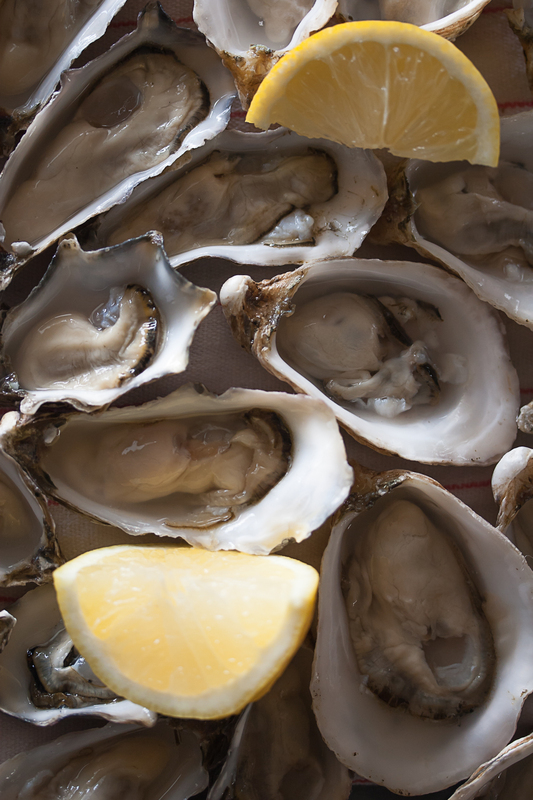 You can eat raw oysters with no dressing. That’s the way real aficionados do it so they can taste the brine of the sea. For me, a little lemon juice brightens the taste. In Louisiana they douse with hot sauce. The classic accompaniment is a fresh mignonette sauce. 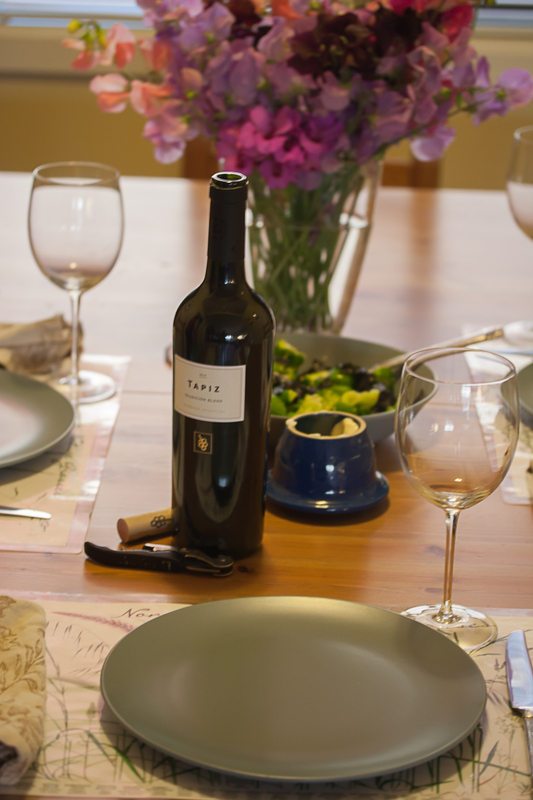 The following recipe is for Sarah’s version based upon ingredients from the farmers market. 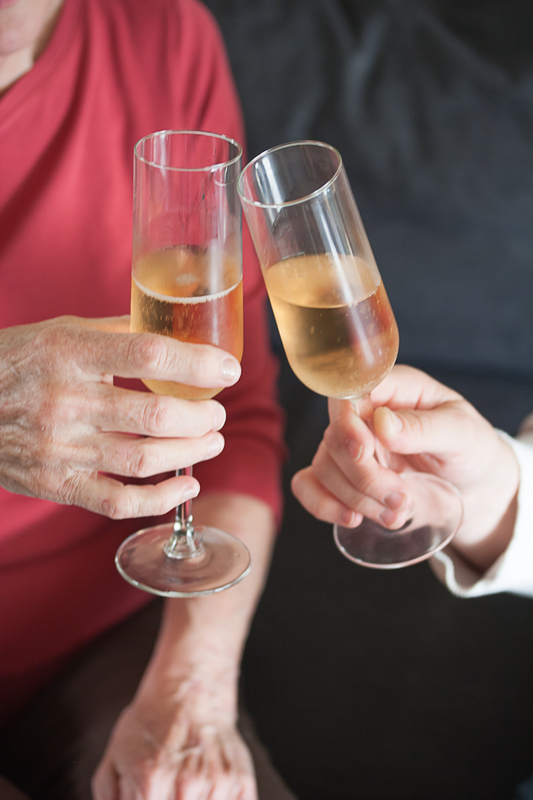 We opened a bottle of California sparkling white wine, toasted the new restaurant, and enjoyed our raw oysters with cucumber-dill mignonette.